Maybe you’re too old to appreciate a gold star, but what about a Gold Dot? 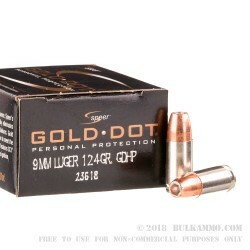 Gold Dot ammo was the first ammo created with solid bonded-core bullets. Speer patented their Uni-Cor method in which they bond the jacket and core from the very beginning of the construction process thereby eliminating core/jacket separation. They start with an alloy lead core and through their exclusive electrochemical process, create an exceptional round with uniform thickness and amazing accuracy. 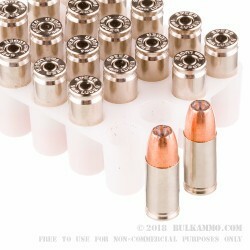 Each of these nickel-plated brass casings are primed with CCI primers for reliable and sensitive performance. The Gold Dot hollow point projectiles are created for each caliber and specific weight to ensure top of the line performance. Having gone through strict tests developed by the FBI, Gold Dot hollow point ammo has excelled at penetration and expansion. Speer’s 124 grain hollow point rounds were created by engineers in a two-step process. They patented their two-step cavity formation after establishing expansion and the rate at which it expands, giving them overall control in the creation process. Each caliber is fine tuned for exceptional performance. Vernon Speer started his company and building bullets back in 1943 when he discovered that re-loaders couldn’t get the supplies they needed from ammo companies during World War II. 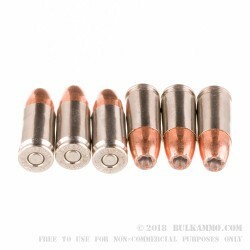 In the 1960’s after primarily focusing on hunting rifle ammunition, his mass-produced jacketed handgun bullets for law enforcement skyrocketed into the famous Lawman line. 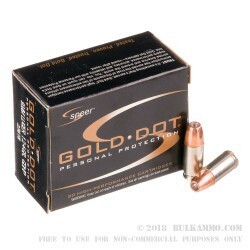 Today, Speer Gold Dot is one of the most trusted rounds in law enforcement.